Condition is New with box. 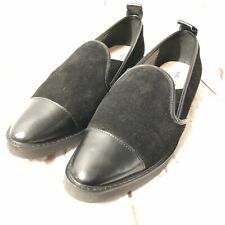 THIS IS A BEAUTIFUL UNIQUE SLIP ON CASUAL SHOE. THE COLOR IS A DARK BLUE WITH HI LIGHTED SPARKLES/ GLITTER THROUGHOUT THE UPPER. THERE IS A LIGHT PADDING ON THE INSOLE, THE OUTER SOLE IS VERY THICK AND DURABLE. Hole doesn't go all the way though the shoe only half way of the platform. New with defect hole on bottom of both shoes. Karl LAGERFRLD Paris Asha Leather Logo Band Slip On Sneakers. Women's 8.5..... Condition is New with box. Shipped with USPS Priority Mail. Condition is New with box. Karl Lagerfeld Paris slip-on leather sneaker. 1.5" platform wedge heel. Rubber outsole. KARL LAGERFELD CLER LOAFERS. BLACK SUEDE/LEATHER. 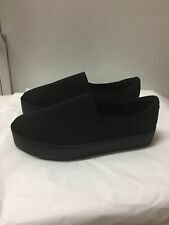 KARL LAGERFELD Sneaker Black Platform Slip On Canvas Sneaker Size 10. Shipped with USPS Priority Mail. Vans X Karl Lagerfeld. Black/K Quilt. Classic Slip On. Vans X Karl Lagerfeld. Classic Slip On. Sizes are double checked to make sure there are no mismatch sizes. 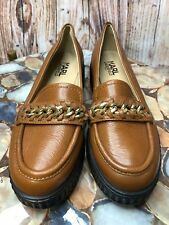 (Vans Style # VN0A38F7OEI) Super comfortable and classic! 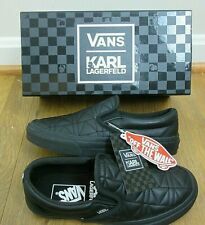 These shoes are a must have for the Vans/ Karl Lagerfeld fan and perfect for wearing all year round. The sole is made with high quality rubber for a nice cushion when you walk. Karl Lagerfeld Womens Shoes Sz 7.5. Condition is Pre-owned and good. Chestnut brown color. Very comfortable! Shipped with USPS Priority Mail. KARL LAGERFELD Suede Sneaker. Color/material: rose gold suede. Rubber sole with traction. Lightly padded insole. KARL LAGERFELD. • CANVAS UPPER. • MAN-MADE LINING. • IMPORTED. • RUBBER OUTSOLE. • LACE-UP VAMP. • ROUND TOE. SNEAKERS /. Karl Lagerfeld Shoes Womens Sz 7.5. Condition is Pre-owned and good. Black with no obvious defects. Shipped with USPS Priority Mail. Karl lagerfeld sneakers. Condition is New with box. Retail $225.00 Shipped with USPS Priority Mail. Condition is Pre-owned. Very good/excellent condition. Karl Lagerfeld shoe bag included. Missing original shoe box. RIP Karl Lagerfeld! Old Skool Laceless. Vans X Karl Lagerfeld. Sizes are double checked to make sure there are no mismatch sizes. These designer shoes from legendary designer Karl lagerfeld were released earlier this month in a limited quantity and locations can be yours! Authentic KARL LAGERFELD. Size:US 6 EU 36 (23,5 cm). Slip-on style. Size: 8.5 US. SK8 Hi Laceless Platform. Vans X Karl Lagerfeld. Chain/K Quilt. Each design showcases Lagerfeld's visionary aesthetic and ultramodern style. About Karl Lagerfeld Slip-on sneakers with perforated cat face design. Rubber sole. Slip-on style. SIZE: 9.5 M.
New Ultra-soft suede flats with charming lace-up details. Suede upper. Padded insole. Synthetic lining and sole. Color/ material: off white textile. Man-made sole with traction. Lightly padded insole. 100% Original Karl Lagerfeld. Exclusive sneakers made of satin fabric. Laces made of velvet. Two large beads on the front. Rubber outer sole. Removable inner sole. Material: SATIN fabric. Size / size 39. 100% Original Karl Lagerfeld. Exclusive sneakers made of satin fabric. Laces made of velvet. Two large beads on the front. Rubber outer sole. Removable inner sole. Size / size EU 41. Material: SATIN fabric. 100% Original Karl Lagerfeld. Exclusive sneakers made of satin fabric. Laces made of velvet. Two large beads on the front. Rubber outer sole. Removable inner sole. Material: SATIN fabric. Size / size 37.